Blogger, which is owned by Google, has updated the Navbar that is displayed across the top of every blog page, except when a Dynamic View is used. Many bloggers hide/remove it, but I like keeping it there for my readers to use if they wish. The right half remains the same. The changes are small, but powerful! Having the G+ Share button in a prime visual position will certainly increase sharing to Google+. 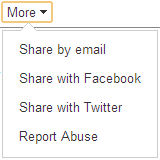 They have also added Share by Email as an option. Each post will continue to have the Share Buttons which includes the +1 widget. Do you like the new changes? What else should they change? Share your thoughts below. I would like to see more options available for publishers other than only having the ability to change the color. An additional change that would be nice to have is the option to display a Twitter and/or Facebook share button in addition to the Google+ one. Lastly, I want the other sharing options to perform like the G+ Share functionality where it overlays on the page instead of opening a new tab. Any clue to show the Twitter and Facebook share buttons always instead of drop down box.